Why should you care about Anchor Point Training ? Imagine enjoyable, effective training anywhere, anytime. Anchor Point Training is a full body, movement based approach to training with anchored resistance. This is training that offers variety, convenience, and is very efficient. This is enjoyable training that can progress and evolve with you for the rest of your life. 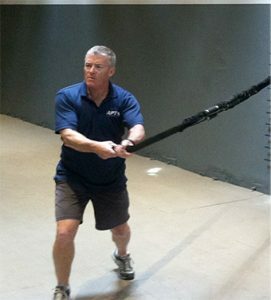 Anchor Point Training equipment is designed for complete, progressive training. This is training at any intensity, in any dimension, with any connection, for every need. If you are somebody that already loves to train and compete, you will appreciate why our equipment design is state of the art. This equipment is ideal for gym, back yard, or field side and can be incorporated into training drills for any sport. Effectively train with the ideal resistance for any range of motion, performance, rehab, or prevention. We offer professional trainers a program of accredited education to help them get the most use out any anchored training tool for their specific needs. Whether you simply want an enjoyable, convenient practice or have specific needs for sports performance, injury prevention or rehabilitation, Anchor Point Training gear and education will help you train yourself and clients to enjoy learning how to train smarter, move better and be stronger. Fair question. Well, for starters it was easy to think outside of a box I was never in. The beginning of my understanding came from playing 40 years of competitive rugby. 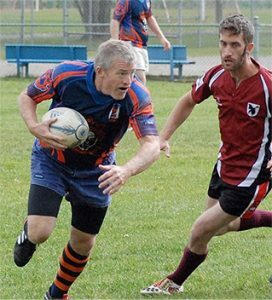 I learned a ton rehabbing injuries and I learned how to keep my aging body quick and strong enough to become the oldest competitive player in the Canadian Rugby Union. I opened a Spa and Gym in 2007 and started training clients using some of the approaches that kept me athletic, basically lots of variety and training resisted movement on my feet. I found the equipment I could buy didn’t quite serve my needs. The first equipment design I created was an anchor system, the ARC. This design was very well received and soon, I was working with experienced trainers in Hockey, Football, MMA , physiotherapists and even the National Ballet of Canada. That was a critical phase of my education, I learned a ton working with a wide variety of talented people who had a wide variety of needs. During this time, my resistance band supplier used my first ideas for MMA specific training to create a successful line of products for themselves. At that point, I knew I had the chops to design better gear. I had a passion for it. I had found a wonderful purpose. In 2012 I sold my spa in Quebec and moved to the heart of the fitness industry, Southern California, to pursue a career as a fitness equipment designer. In 2013 I was asked to present my ideas on training with elastic resistance at the first NORCAL Fitness Summit. It was a key point in the journey. I needed to make a good impression on a room full of smart, influential fitness people. I wanted them to get a real sense of the potential the training approach I was developing had to offer. I knew I needed to present more than a bunch of interesting new exercises, I needed to present them with a conceptual overview. I wanted them to see the potential beyond the actual exercises I was demonstrating. After some thinking, I realized I was always talking about the same 3 things when describing training with anchored resistance. The penny dropped when I realized these three elements were constant variables in the formula, which is the summation of forces of any resisted movement with any anchored tool. It was a eureka moment. While the APT tool designs are inventions, the education overview is different – it is a discovery. I discovered the APT overview simply because I geeked on this particular training approach exclusively for years. When I “got it”, I knew I had something very useful that I needed to go deeper on. That has been the process since. The idea of the APT overview can be applied to any training need with any anchored tool. It is a mechanistic approach that can help any trainer better manage the summation of forces in any movement pattern. It’s simple and it works. When it comes to the equipment, the designs are constantly evolving. The suspension strap offers more resistance and connection options than any of it’s competitors. The elastic resistance tool is considered the best bar none by virtually all that use it. The handle designs are massively versatile. We all know there are many ways to be strong, this lesson is driven home when we train a new movement for the first time. Strength is very specific. Anchor Point Training is all about the ability to create specific and versatile strength adaptation. This is done by providing the ability to simply create useful overload with specific resistance angles and connections through any ROM. We’re not done developing by a long shot. We now have master trainers delivering workshops and new education for professionals and all needs. 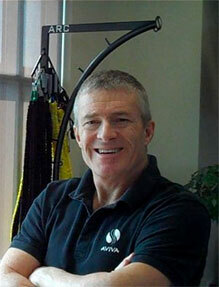 I thank you for being here, and hope you’ll choose to use our gear and education to enrich your practice. Progress is learning how to work smarter. Better is always possible.